My last thread wasn't replied to and I think I might have posted it in the wrong section. I have the same problem... i want to know if in your adium let you choose an a Jabber account because it let me.. and when i add a contact selecting that count, the message doesn't show up! Unfortunately, this is a known issue that has not been resolved, yet. It appears Microsoft has changed something server-side that has caused the breakage. See http://trac.adium.im/ticket/14965 for details. I'll add this issue to the list in the "Known Issues" thread. Any idea on when this will be solved? I'm having the same problem as Sebastien. When I try to add a contact, or someone adds me as a contact, I am able to add them and they appear online until I sign off. The next time I sign in, they appear offline even if they're actually online. This is a huge problem. When will this be resolved? Due to this problem, my business is being affected. With Adium 1.4.2, this will be fixed. A beta will be released next month at the latest, I guess. Great. Adium is truly one of the superior mass chat messengers online. I've been holding onto Adium despite this problem. I know this is a known issues but still want to add that I got the same problem. I'm adding contact with Microsoft Messenger, you can download that on the Apple site but is also deliverd in the Office for Mac. 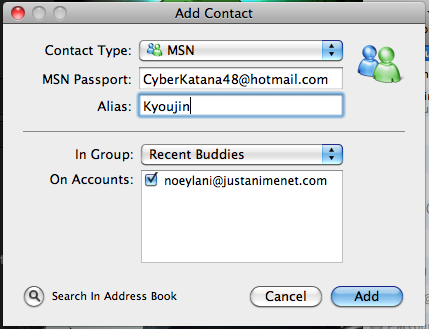 Make sure you delete the contact in Adium and add them with Microsoft Messenger. Also I noticed contact will add to your list, when adding the contact with Adium, but won't come online even if they are. First it worked for me to add contacts with the online clients of Messenger but that doesn't seem to work for me now. I also have not been able to send files lately either. Plus in the latest version if I drag a photo into the window it no longer does a file transfer, it attempts to put the photo right into the message which doesn't work for everyone.